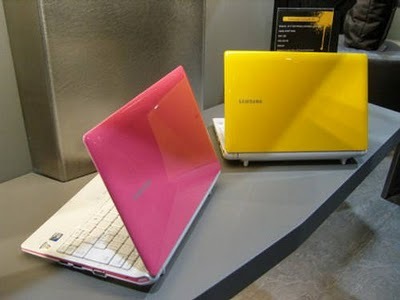 After the success of Corby mobile, the electronics company Samsung has decided to bring netbook in line, offering bright and vivid colors such as yellow and pink with the Windows 7 operating system, while the price at which the EC can we take home is € 329. Samsung Corby N150 is equipped with an Intel Atom N450, non-reflective LCD screen 10.1 “with resolution of 1024 × 600, 1GB of RAM, hard drive 250 or 160 GB, VGA, 3 USB ports, SD memory card reader , card wireless LAN, integrated webcam and battery 6-cell lithium ion battery that provides us with up to 8.5 hours of battery life. This entry was posted on July 18, 2010 at 5:59 am	and is filed under Notebook Technology. Tagged: Corby, N150, Netbook, Notebook Technology, Samsung. You can follow any responses to this entry through the RSS 2.0 feed. You can leave a response, or trackback from your own site.